THE RIGHT KIND OF GRIND. Hold onto your handlebars because GRAVEL. Is. Back. 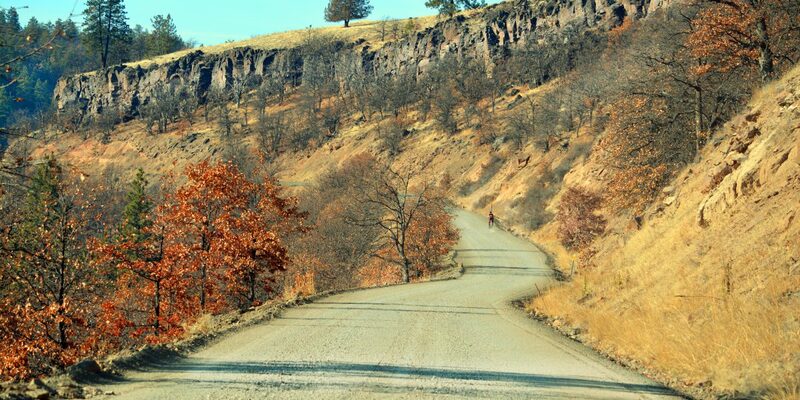 Our inaugural ride was so much fun we decided to do it again – only this time, we’re heading to the stunning expanses of high, lonesome prairie, and forested foothills surrounding Dufur, Oregon for an unforgettable trip down some of Oregon’s most scenic backroads. 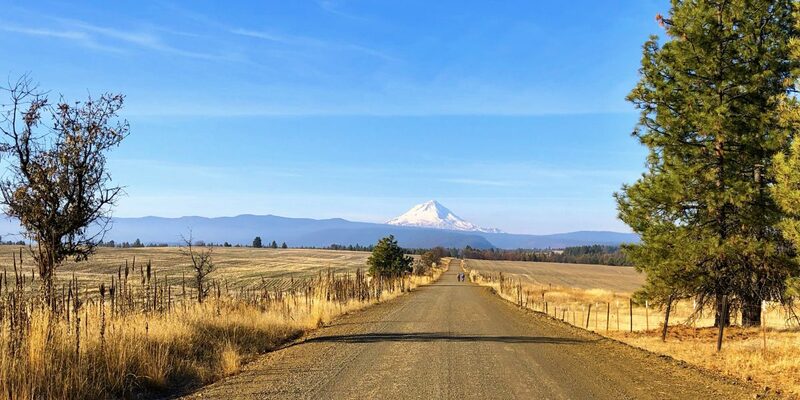 For one golden weekend in mid-May, we’ll be cruising a combination of gravel and paved roads, with wide-open views of Mt. Hood and Adams appearing around nearly every corner. Join us for the camping, the music, the food and the fun, and let’s get grinding! View the RIDE GUIDE and full Day 1 and Day 2 route maps. This route takes us into the foothills leading towards Mt. 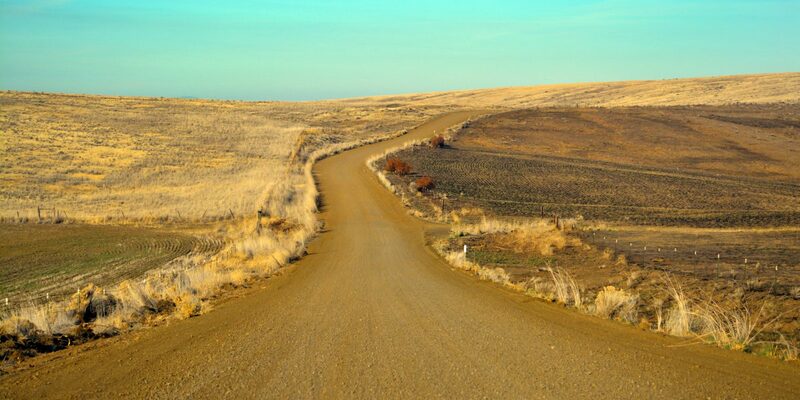 Hood and along miles of high plateau grasslands that quickly turn to forest. 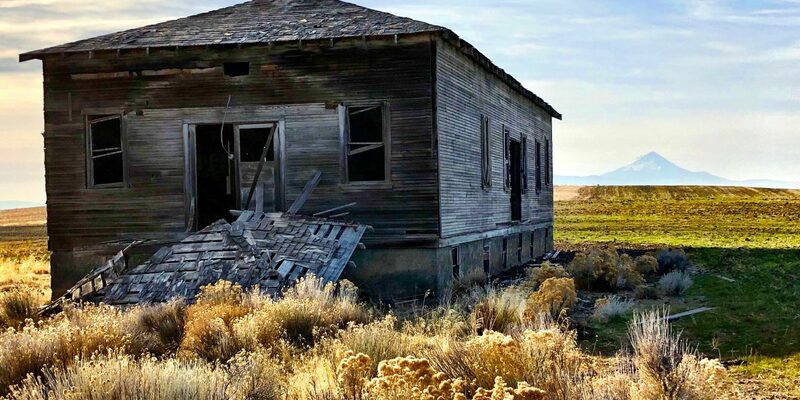 High plateaus and rolling wheat fields lend the setting for spectacular panoramas that get better around every turn. The overnight site will have an area designated for camping. Don’t forget to bring your tent, ground cloth, sleeping bag and pad. If you’d like to bring your RV or camp trailer there are a limited number of spaces with hookups on site for an additional fee of $70. If you would like to sleep in your non-RV vehicle or do not require a hookup, you must still register your vehicle. If you choose to sleep in your vehicle, you will be doing so in the parking lot and will need to be contained to a standard parking space. There is no tent camping in the parking area. Camping and overnight parking is available for Friday and Saturday nights only, click here to get a parking pass. Directions to the camp will be emailed to you in the Ride Guide in April. They will also be listed on the parking pass. Overnight parking for Friday and Saturday nights only is available for $10 (click here to get a pass). We will provide directions to the event in the Ride Guide (emailed in April) and on the parking pass (mailed in early May). There will be signage pointing you to parking when you arrive. After parking, follow the signs to the rider Packet Pick-Up area. You may want to check in and get acquainted before unpacking all your gear. The Bike Gallery’s team of bicycle technicians provides mechanical support at the overnight site. Technical support is available for emergency repairs of well-maintained equipment. It is your responsibility to make sure your bicycle is in good condition. Labor is available at a discount. Look for the Rider Services trailer in camp. Here you can ask questions, meet friends or locate missing items at lost and found. The Cycle Oregon Gift Shop is where you can shop for some great Cycle Oregon merchandise. We’ll have this year’s ride jersey and a selection of Cycle Oregon merchandise. There’s tons of fun stuff: lights, coffee mugs, windbreakers, water bottles, and more. On Saturday only, after a long day in the saddle, bring your tired legs down to the massage tent. Our therapists use a variety of Swedish, deep-tissue and sports massage styles to keep you riding strong all week. Massage relieves muscle pain and tightness by stimulating circulation, helping you recover after extreme exertion and stopping spasms before they stop you from riding. Massage can be tailored to your pressure preferences and to the areas where you need it most. On Saturday only, stretch out the muscles that get tight during cycling. Yoga will help you stay close to your breath this weekend. Not only will this help you feel better, but stretching can also help prevent injury. Mats are provided. Cycle Oregon will provide dinner at the overnight site on Friday and Saturday, and breakfast at the overnight site on Saturday and Sunday. Lunch will be served Saturday and Sunday. All meals will be provided in camp. The Beer & Wine Garden will feature a variety of local beer and wine. Friday and Saturday evenings at 7:00 p.m., the Cycle Oregon community will gather around the Main Stage. This is a great opportunity to hear tips about the next day’s route and catch up on some local folklore. Best of all, it’s always followed by legendary Cycle Oregon entertainment. Cycle Oregon showcases some of Oregon’s most talented performers. Performances are scheduled for Friday and Saturday evenings on the Main Stage. Course support services are available only during the course hours. If you start before the course opens or are still riding after the course closes, there will be no support services available. 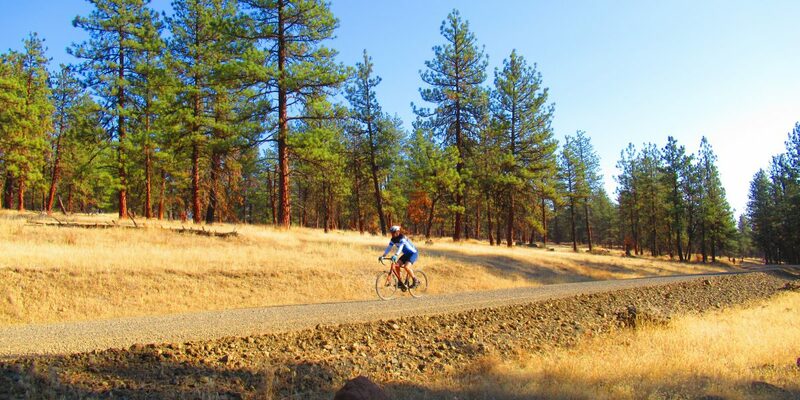 All Cycle Oregon riders must be on the course by 9 a.m. Those still on the course after 4 p.m. (3:30 p.m. on Sunday) will be offered a ride to camp. If you choose not to take the ride you will be on your own to get back to camp. Lunch will not be served on the course. Lunch will be provided in camp each day from 11 a.m.–4 p.m. There will be two rest stops available along the route each day to provide water, beverages and nutritious, delicious snacks. Rest Stop signs alert riders when one is ahead. You can also see the location of each Rest Stop on the maps that will be inside the rider packet you receive when you check-in. Rest Stops are open from 7 a.m. to 3 p.m. There will be multiple SAG vehicles on the course each day. They are available to transport cyclists in cases of mechanical problems or medical injuries. They also have extra water, snacks, and sunscreen if needed. If at any time you need assistance, please signal a SAG with a “thumbs down” signal. If you do get into a SAG, you may not be transported directly to camp. The SAG vehicles usually wait until they are full to go to camp. The Bike Gallery will have mechanics in camp. They will make basic repairs in order to get you through the weekend. Cyclists will incur any charges associated with parts or extensive repairs. MetroWest provides Advance Life Support ambulances that give around-the-clock medical support on the course and in camp. If you require medical attention on the course, you should notify a SAG, ambulance, or staff vehicle with the “thumbs down” signal. Friday, May 17, from 3:00 – 9:00 p.m.
Saturday, May 18, from 6:00 – 8:30 a.m.
Packet Pick-Up will not be available at the office prior to Gravel. Do not pitch your tent prior to 3 p.m. on Friday. When you check in, you will be asked to sign a waiver and then you will receive your packet that includes a wristband, and course maps. Bring a photo ID. You must show your photo ID to pick up your packet. Once we affix your wristband, it should not be removed unless you leave the ride. The wristband is what identifies you as a participant and gives you access to meals and course support. What bike should I ride and what should I carry? At any gravel event you’ll see a mix of ‘cross bikes, adventure bikes, mountain bikes, and a handful of hearty souls on road bikes. A gravel specific or Cyclocross bike is likely to be the most fun on these routes, but a bike you are comfortable on for these kind of miles, so long as it can run fat enough tires should work just fine. Make sure that you have at least 32 mm tires, ideally a bit fatter, and with a bit of tread to help in the sections of deeper, looser aggregate. If you are running knobbies, something with a smoother middle, and knobs on ‘shoulders’ for a lower rolling resistance will likely suit better for the pavement portions of the course….don’t forget to bring a repair kit with extra tubes just in case. A frame or other bag for your bike or small backpack to carry some extra food, water, and clothing layers is a great addition for this event. 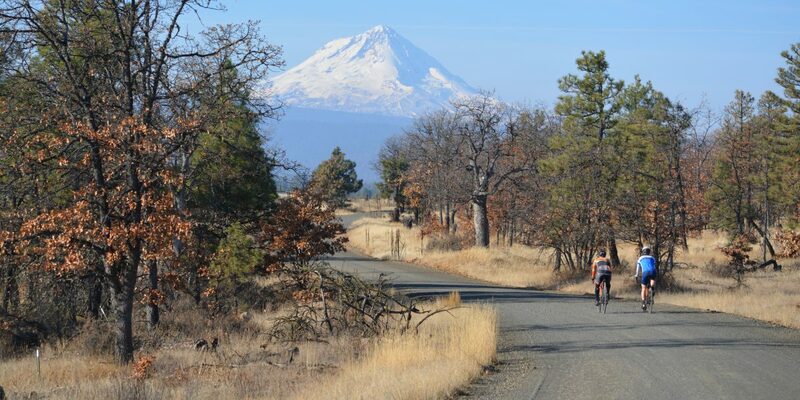 While we have fully stocked stops and SAG support on the routes, riders should also be prepared for a measure of self-reliance as stops are placed a bit farther apart than you may have experienced if you have participated in other Cycle Oregon events.